What is Keratin, the Keratin Treatment, and Benefits? When it comes to keeping your hair healthy, there are several things to consider. There are treatments, you can try at home, however selecting a stylist with knowledge and experience will provide the right treatment that will make a significant difference in the health of your hair. Keratin can be an option. A keratin treatment can strengthen your hair and leave it silky smooth and shiny. There are also keratin products you can use in between salon treatments that help maintain the results of your keratin treatment. Keratin is a protein that is naturally in hair. It is also in nails and skin. The protein is in glands and internal organs as well. Keratin protects tissue in the body. It resists damage from trauma and friction such as scratching and rubbing. The keratin in hair products is often derived from the wool or horns of various animals. Some forms come from feathers. It is a building-block protein in the hair, which is why many stylists believe that keratin treatments can make your hair stronger and healthier. Using keratin for hair makes the strands shiny and more manageable. The keratin treatment will be more active on healthy hair. Treatment results also depend on the thickness of the hair and the type of keratin treatment used. 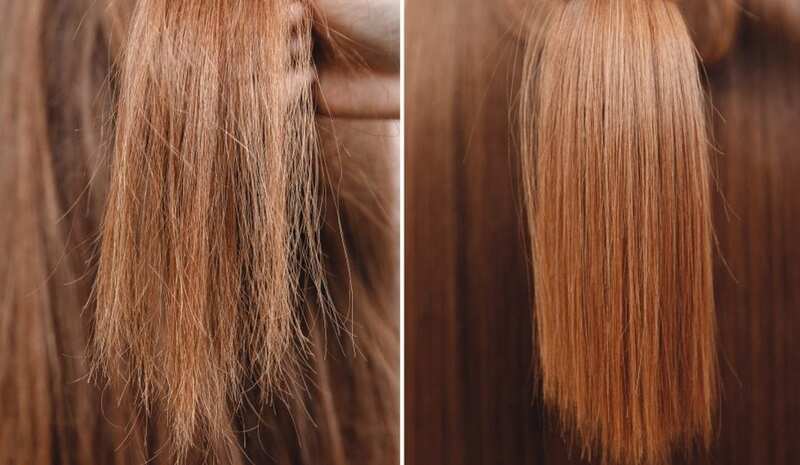 Keratin smooths the cells that overlap each other to form hair strands. The cell layers, also known as the cuticles of the hair, absorb keratin and make the hair look fuller and lustrous. If your hair is extremely curly or has a wavy texture, you may be wondering, “What does keratin do for curly hair?” Individuals with curly hair can use keratin to make their hair less frizzy an easier to comb and style. It can also reduce your blow dry time by 50%. Some curly hair types, even appear straighter after a protein treatment. The benefits of keratin treatment for curly hair often come from a keratin treatment. We offer three types of keratin treatments; GK Global Keratin, Kerasilk by Goldwell and the Keratin Complex. These processes are time-consuming and works best on thick and curly hair. There are several steps in the keratin treatment process. First, a cream is applied to the hair. Then, the hair is blown dry and straightened. After the treatment, it is best to keep the hair dry for 2-3 days. When a client goes to the salon to have the keratin treatment washed out, a setting treatment is applied to the hair to keep the strands straight. This method usually lasts for about 12 weeks. There are also keratin shampoos, conditioners, and serums that can be applied to the hair. However, these products do not produce the same effect as the Brazilian treatment. Keratin serums, conditioners, and shampoos make the hair resistant to heat and chemical damage and can repair damaged, color-treated and heat-styled hair. Products with the ingredient “keratin hydrolysates” are high quality and will likely make a difference in the texture and strength of the hair. According to research conducted in 2013, keratin could be an effective treatment for people who want stronger hair. Keratin supplements are also available. The supplements can be purchased at health and natural food stores and can be taken in capsule or powder form. It is important not to take too much of the supplement over an extended time to avoid protein buildup in the body. The team of professional stylists at Public Image Ltd is happy to help you find the keratin treatment that will work best for your hair type. Browse our gallery on our website to see our hairstyles, get style inspiration, or schedule an appointment. Our salon is located in Wayne, NJ In Passaic County. Let’s get started and help you to look and feel amazing!